A holiday massage is always a treat, but what if it could be more than that? What if it could contribute to your ongoing wellbeing, long after you�ve left the spa? 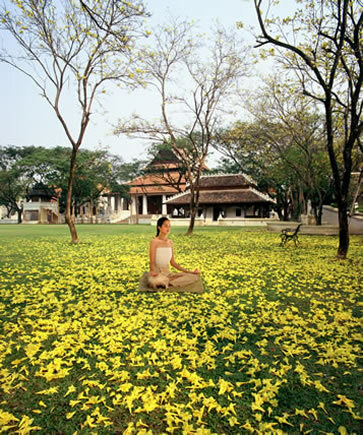 Bridget McNulty discovers the power of Ayurveda at the Dheva Spa, at the Dhara Dhevi Hotel in Chiang Mai. The ancient art of Ayurveda (meaning �Science of Life�) is a holistic healthcare science that originated in India more than 5000 years ago, and is widely known as the oldest healing science in existence. It�s fitting, then, that it is practiced at the Mandarin Oriental Dhara Dhevi in Chiang Mai, a hotel that�s really more of an ancient city, and that looks as if it�s been around for 5000 years. What�s so unique about the Dheva Spa�s approach to Ayurveda is that it combines the knowledge and science of the ancient healthcare system, with all the luxury and decadence of a five-star spa. The treatment begins with a half-hour Health Assessment, in which you answer three brief questionnaires covering aspects of your health and current mental and emotional state (which is a lot less intimidating than it sounds � they�re all multiple-choice questions!). Dr. Sunita then explains what your answers mean, giving a thorough breakdown of how your physical and mental attributes fit into the Ayurvedic system. Ayurveda is based on the concept that the body, mind and environment are directly interrelated forces of energy, which sustain the health and well-being of each person. However, in order to maintain a proper balance between these energies, we need to understand which energy is dominant. Through an analysis of your physiological profile, it�s possible to determine which of three �doshas� (a Sanskrit word meaning �that which can go wrong�) is dominant, and what balance is ideal for you, personally. The three doshas are �Vata� � Air, �Pitta� � Fire, and �Kapha� � Water. All three are present in everyone, in different degrees. My dominant physical dosha was Pitta, meaning that I carry stress in my digestive system, particularly in my stomach, and that I should start each day with warm food (to start the digestive fire), never mix cooked and raw food, and avoid too much caffeine and refined white flours, which overheat the fire (this is all in layman�s terms, of course!) Dr. Sunita gave me a few very helpful tips on how to combine foods for optimum wellness, as well as suggesting meditation and breathing techniques to calm my Vata mind (which tends to race � a million thoughts a minute). Although most of it is simply sensible, what makes Ayurveda so powerful is that there is science behind it, ancient science that has been proven over the years ... A good incentive to take it seriously! I asked specifically about diabetes, and if it was more prominent in one of the doshas, but apparently it can develop in any one. We discussed my condition in a lot of detail, in particular things like circulation that are an offshoot of it (I get cold feet easily), and the importance of eating regular small meals (which I tend to do). Dr Sunita then advises the therapist on which treatment you need to balance your doshas, most of which involve a lot of warm Ayurvedic oils (simply heavenly, no matter how squeamish you might be about having oils poured over you!). I was given a Pottali Abhyanga treatment, a highly rejuvenating massage where freshly prepared herbal rice compresses are dipped in warm fragrant oil and applied to the body (it enhances immunity and circulation � both an issue for me because I�m a Type 1 diabetic) and proves deeply relaxing for body and mind. This was followed by a short Shirobhyanga treatment � an ancient Indian head massage that is typically Ayurvedic, where warm oil is dripped on to your forehead. Amazing. The combination of ancient knowledge set inside what looks like an ancient palace, with highly skilled therapists working in private treatment rooms adorned with Thai silk, teak and antiques, makes for a truly memorable treatment. The scent of the oil, the sight of the carefully chosen d�cor and the touch of the massage combine into a sensory experience that is not only pleasurable, but deeply healing for your body. Style Holistic opulence. The spa is a replica of a Mandalay Palace, a truly stunning structure, but the therapies are all holistic and adapted from traditional practices from Northern Thai, Burmese and Indian culture. Setting In the middle of the ancient city of the Mandarin Oriental Dhara Dhevi resort, on a massive 3100 m2 area of land. Why you'll love it An Ayurvedic health consultation will give you information about how to eat, sleep and exercise to feel more vital� And the treatments are pure indulgence. Good to know The eighteen treatment rooms have been designed for individuals and couples, so if you�d rather have a treatment with your partner it�s all set up for you. Address 51/4 Chiang Mai � Sankampaeng Road, Moo 1 T. Tasala A. Muang Chiang Mai 50000 Thailand. How to Get There The Dhara Dhevi has a pick-up service from the airport (15 minutes away) or Chiang Mai city centre (10 minutes away). 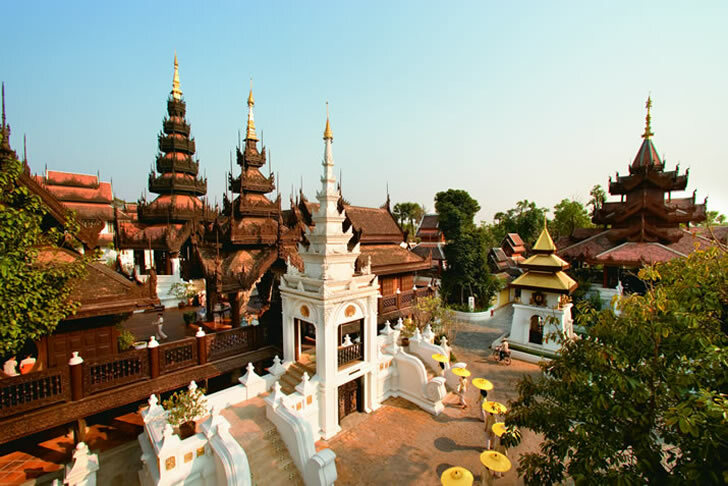 Fly into Chiang Mai International Airport from most major cities in Asia. Hi, I am travelling to Chiang Mai next month. Do you have any reservations available in the last week.